The New Humanitarian | Are mothers and children missing out on Nepal aid? Nirmala Tamang is not given to panic. She is used to the hardships of living in a remote farming community. But the earthquake that struck Nepal on 25 April destroyed her confidence as well as her house. The 20-year-old mother-of-two is worried about providing the right nourishment for her infant girl and baby boy. In addition to their home, they lost their goats, their cattle and all their stocks of food. Now Tamang, her husband, their 14-month-old daughter and three-week-old son live under a makeshift shelter of twigs, thatch and sheets of tin. Her 28-year-old husband Surendra told IRIN he had been unable to find any work since the earthquake. Without a job, he fears he is unable to support his family and buy the food his breastfeeding wife and tiny children so desperately need. There was a recent delivery of food aid to the nearby town of Sankhu, which was badly damaged by the quake. But nothing came to Tamang’s village. “The supply of relief is more for areas with mass destruction and displacement and not for places where houses are only half-destroyed,” local social worker Bikash Tamang explained. The way aid is prioritised in Nepal has led to fears that pregnant and breastfeeding women in certain areas – as well as infants and babies – are not receiving the specialised help they need. We need to be extra vigilant now, especially with the situation of infants. The UN Population Fund, UNFPA, estimates that 126,000 pregnant women have been affected by the disaster and is rushing to deliver reproductive health kits to communities around Nepal. Sumnima Tuladhar, executive director of Child Workers in Nepal (CWIN), agreed that targeted programmes are needed to care for mothers and children. “We need to be extra vigilant now, especially with the situation of infants, and there is a need to act fast to scale up pediatric services,” Tuladhar said. CWIN has teamed up with the Nepali National Pediatric Society and has already conducted medical checkups on some 1,800 children in 11 of the worst-affected districts. While the physical needs of children are relatively straightforward to diagnose and address, assessing their psychological wellbeing after a major disaster is often much harder. Experts say it is crucial that children of all ages are able to express themselves openly. “Usually, there are children who are either hyperactive or very withdrawn and it is important to create a child-friendly environment for the children,” said psychologist Akanchha Karki, who works with CWIN. There are now numerous so-called “child-friendly spaces” run by various aid agencies in Kathmandu and other affected districts, in which games, sports and other activities are organised. Les victimes du séisme au Népal ont-elles besoin d’être guéries par la scientologie ? Sunita Shakya works for Seto Gurans, an NGO that is running a Temporary Learning Centre with the support of the UN children’s agency, UNICEF. 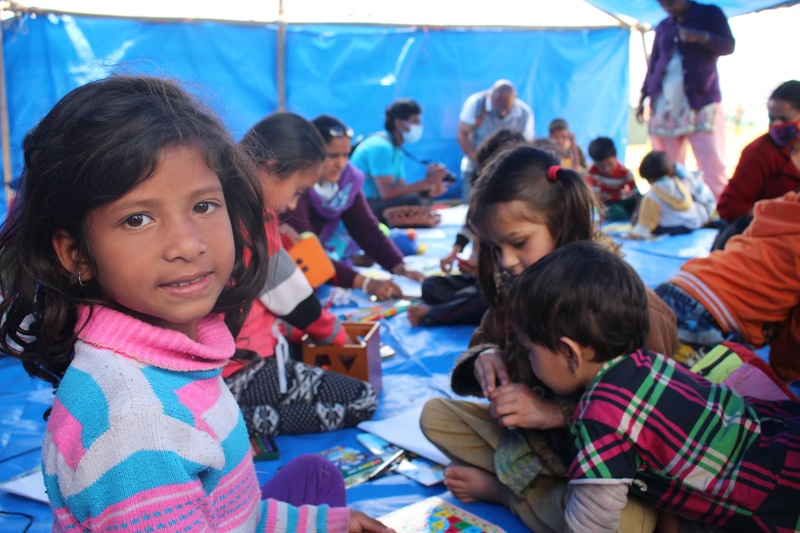 “It makes a huge difference when you see children sitting with their peers in a camp that tries to create a learning environment,” Shakya told IRIN. UNICEF has also started a daily programme aimed at children and broadcast live on Radio Nepal called “Herdai Sundai,” which means talking and listening. The station is the largest radio network in Nepal, claiming to reach over 70 percent of the country’s 28.5 million population. But in many parts of the country outside the capital, aid agencies have yet to initiate projects that specifically target older children and teenagers. “A lot of children have seen or heard of other children dying, and now is the time for counsellors to be mobilised everywhere in the earthquake affected areas,” said Karki. Twelve-year-old Manju Tamang, picking her way over the remains of her ruined school, showed just how resilient children can be. عندما بلغت رامي بيسووكارما سن الـ 33 كان قد مضى على زواجها 20 عاماً. وعلى الرغم من أن قريتها كاتيغاري في منطقة سورخيت غربي نيبال قد شهدت حملات متعددة ضد زواج الأطفال، لكنها تقول أنه لم يتغير شيء تقريباً.